The nine glassworking centers covered in this publication are only a selection from a potentially long list. For example, the story of Venetian-style glassworking in Croatia—Dubrovnik in particular—is fascinating and the subject of current investigation.15 This e-book presents some of the best-known and most prolific centers, such as the Low Countries and France, as well as a Swedish glasshouse that, in its brief existence, produced at least one masterpiece that has survived to the present day. The order of presentation is based roughly on increasing geographical distance from Venice. The study begins with Florence to stress the fact that Venetian-style glass was being made on the Italian peninsula well outside Venice. Nikolina Topić, U traganju za renesansom: Staklo iz arheoloških istraživanja na dubrovačkom području = In Search of Renaissance: Glass from the Archaeological Excavations in the Dubrovnik Area (exhibition catalog), Dubrovnik: Dom Marina Držića, 2017; Topić, “Goblets of the Late- to Post-Medieval Period from Archaeological Excavations in Dubrovnik,” Annales de l’Association Internationale pour l’Histoire du Verre, v. 20, Fribourg and Romont, 2015 (Romont, 2017), pp. 482–489. Cite as (MLA): Gudenrath, William. 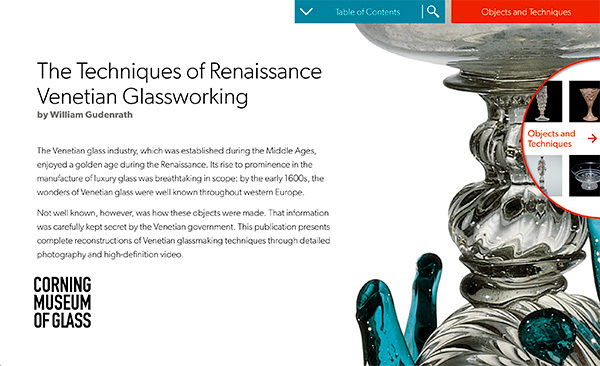 The Techniques of Renaissance Venetian-Style Glassworking, Corning Museum of Glass, Feb. 2019, renvenetianstyle.cmog.org.